Tinnitus is hearing a sound in the ear when no external sound source is present. It can be caused by exposure to loud noise when it often occurs with deafness and is called Noise-Induced Hearing Loss (NIHL). Tinnitus can significantly reduce quality of life. It can cause anxiety, depression, poor concentration and performance at work. As a result, relationship breakdown can occur. ZenPlugs wanted to find out how many tinnitus sufferers had insomnia as a result. They could find no studies which had surveyed this so they decided to perform one of their own. ZenPlugs found that an astonishing 40% of people with tinnitus suffered from insomnia on a daily or weekly basis. This is compared to 31% without tinnitus. It causes more of a problem at night because during the day there are sounds present which mask the tinnitus. As it is much quieter at night the tinnitus is more noticeable. This can lead to a vicious circle of tinnitus, anxiety and insomnia. Each can lead to every other. People may lie awake worrying about being tired the next day, worsening the tinnitus, which in turn keeps them awake. 20% of tinnitus sufferers had their leisure time affected and 10% found that their family time suffered. This may be because of associated hearing impairment making conversation difficult. Alternatively it could be caused by the associated anxiety, depression or irritability caused by sleep loss. Significantly, 14% of the cases in the survey were caused by NIHL, more than any of the other known causes. NIHL is an important cause of tinnitus because it can be prevented by wearing PPE ear plugs and reducing noise exposure. Otherwise damage to the sensory cells of the cochlea occurs when sound energy travels from the eardrum through the small bones of the ear. As well as through the air in the ear canal, sound is conducted through the skull directly. This is known as bone conduction. Ear plugs effectively block transmission of sound through the ear canal. Very high volume noise such as from a jet engine or a pneumatic drill needs reduction of bone conduction to protect hearing. This is why people wear over-the-ear hearing protection with PPE ear plugs when exposed in this way. 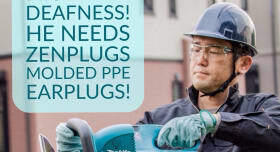 ZenPlugs Molded PPE Ear Plugs are ideal for preventing NIHL as they effectively reduce dangerous noise volumes. They are also amazingly comfortable. Using a patent-pending technique the plugs are molded in the ears in a simple one stage process. This gives fitted plugs which exert no pressure and stay in the ear. This is unlike foam PPE ear plugs which tend to be uncomfortable and fall out due to the fact that they expand in the ear canal. ZenPlugs are also antibacterial and are supplied with a cord to stop them being lost. They are the only PPE ear plugs in the world which are healable and can be remoulded as often as you need. Because they last for years there is a significant cost saving compared to disposable foam plugs. This is particularly so with heavy usage. Compared with using one pair of foam ear plugs per day, at 5p per day when bought in bulk, a pair of ZenPlugs will pay for themselves in around 10 months. As they are molded from a kit they cost far less than ear plugs made by an audiologist. Conclusion. 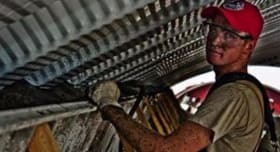 Noise Induced Hearing Loss is a common cause of tinnitus and is easily prevented by wearing PPE ear plugs. 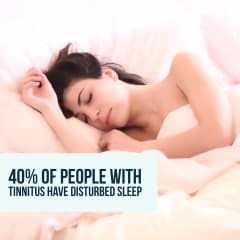 Tinnitus causes suffering to 40% of people through insomnia and reduced enjoyment of leisure time. ZenPlugs Molded PPE Ear Plugs are ideal for preventing NIHL. They are comfortable, effective and offer a significant cost saving compared with other ear plug solutions.